Source: “The Links of a Legacy: Figuring the Slave Trade to Jamaica.” Chambers, D. In Annie Paul, ed., Caribbean Culture: Soundings on Kamau Brathwaite. Kingston, Jamaica: University of the West Indies Press, 2007, pp.287-312. Do you have any info about the maroons in Suriname? I read that they were from Congo, and to me , they look more like central africans than ghanians etc. 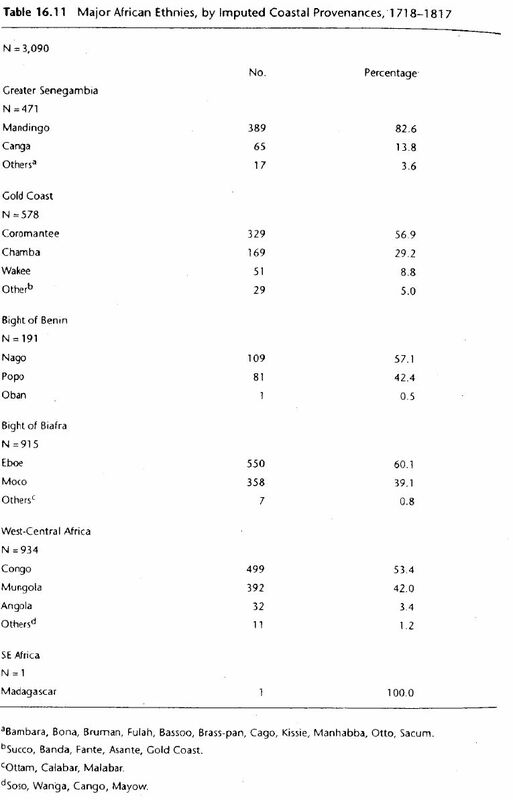 From what i’ve read Surinamese Maroons should have multiple origins across Western Africa, but Congo could be a significant part of their ancestry indeed. Their cultural retention is very fascinating, many distinct influences from Ghana, Benin and also Congo can clearly be recognized. I intend to blog about Surinam and the Dutch Caribbean, so in the future there will be a separate section of charts for them. In the meanwhile you can check out this overview which shows the African influence on Surinamese languages, the number of African words is very impressive, probably the highest in the Americas! 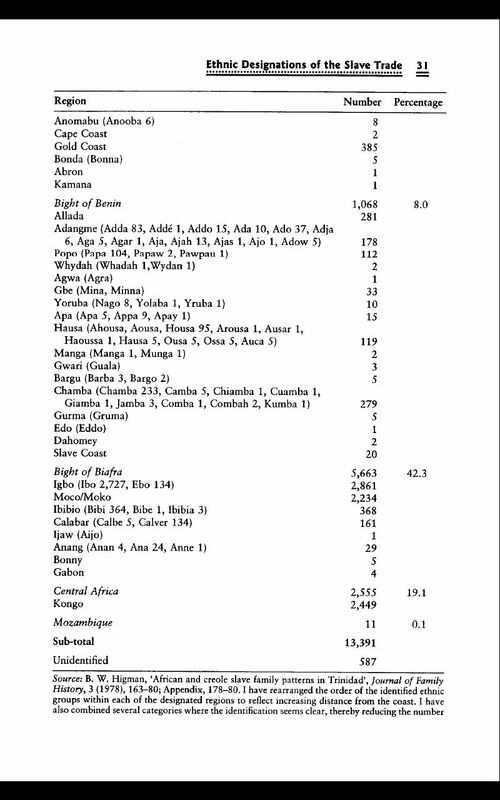 Bantu words are 28% while Kwa languages (both Ghana & Benin) provided 47%. This website , Slave Trade to Surinam, is also very informative. Wonderful blog. I share your passion, and interests. With St Lucia, Breen suggests Martinique traders controlled the trade. I still can’t work out where on the Island the British would have disembarked the slaves. Or how, alternatively, the re-exports operated: were slaves brought over on slave ships or simple boats? Lastly, Delphinus argues most of the slaves were actually from the Senegambian region and the hinterlands during French period, and extending into the Malian hinterlands. Thanks for commenting James! Great to hear you share the same interests. Recently a book appeared about the intercolonial slave trade which might have some answers. I haven’t read it yet, but i’m about to read an article by the same author. I will let you know if i come across anything specific about St. Lucia. “Final Passages: The Intercolonial Slave Trade of British America, 1619-1807” by Gregory E. O’Malley. Btw you might be interested that just the other day i created a new page featuring the AncestryDNA results of people from the West Indies. One of them is from St. Vincent and he indeed had a pronounced “Mali” score, however it might not be the most typical outcome for West Indians. Geat blog. I was wondering if you had any data on Barbados? 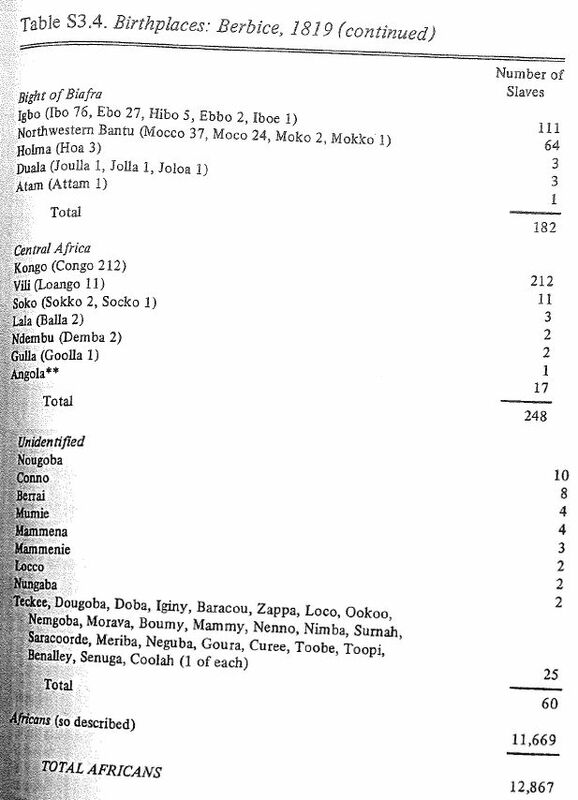 I know there was a lot of slave trade between Barbados and Charleston, S.C. and I am wondering if the results are similar. Barbados is indeed an interesting place to study because it was heavily involved in intercolonial trade but also because its population was one of the earliest ones in the West Indies to show natural growth, which implies that for Bajans tracing their African roots they will generally have to look into earlier timeperiods. 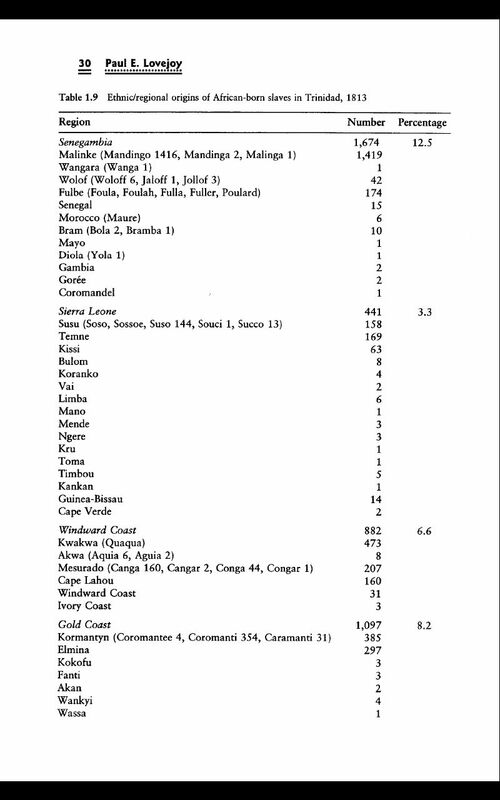 Would you happen to have information on the blacks in Grenada? I do know on Carriacou (sister-isle to mainland Grenada) most blacks are Temne people. But as for Grenada itself, I have no clue. Very curious about that. Yes the Temne connection for Carriacou is very remarkable! 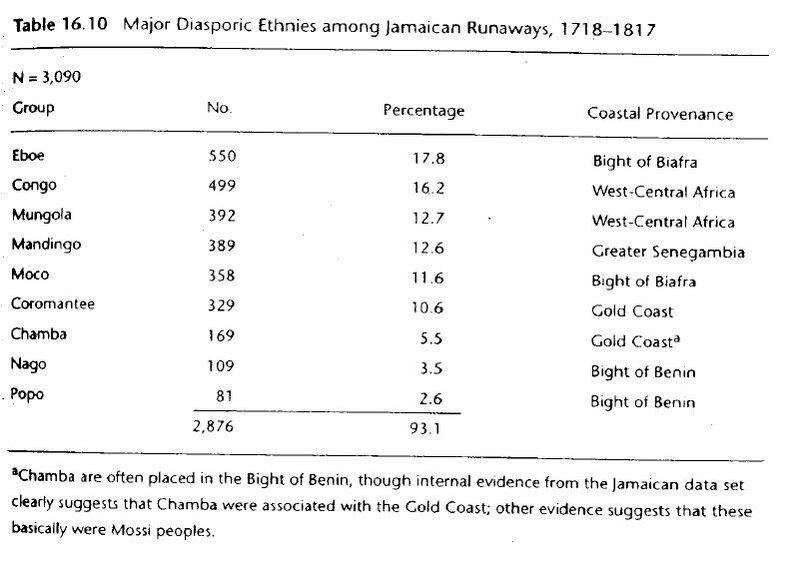 However i’m doubtful if such exceptional African retention among a small group of people would also be indicative of the African origins for the majority of the Carriacou population. I remember reading there are several documented refernces to other African ethnic groups as well. Some of which also appearing as the African Nations in the Big Drum Dance. I might blog about this some day in more detail as i find it very fascinating. I am also intending to do an update of this page eventually. I will then provide more details on several AncestryDNA results i have collected from Grenada. 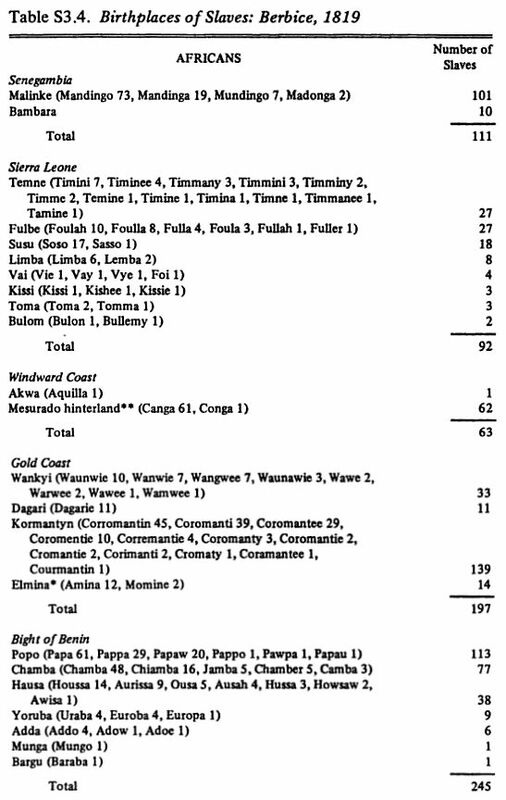 In the meanwhile you can already consult this chart based on the Slave voyages Database. Keep in mind though that inter-colonial slave trade as well as inter-island migration in later timeperiods is not being accounted for.